Johann II Wilhelm (John William), Elector Palatine of the Rhine (Kurfürst von der Pfalz), 1690-1716, was born 19 April 1658, son of Philipp Wilhelm von Pfalz-Neuburg (1615-1690), Elector Palatine of the Rhine, 1685-1690. Johann Wilhelm succeeded his father as elector in 1690. Johann Wilhelm was a strongly Catholic ruler, who was not interested in the needs of his non-Catholic subjects. Not until eight years after the death of his father was the "concession" granted the Mennonites renewed. Repeated petitions were ignored, largely because of the distress caused by the war Louis XIV made on the Palatinate. On 10 February 1698, the Mennonites presented their petition again, and were heard. On 18 February the elector issued an order to his magistrates to grant the request and carry out its requirements. On 3 November 1698, followed the decree renewing the concession. In Johann Wilhelm's reign occurred the forcible evacuation of the Mennonites from Rheydt (1694), which attracted much attention. At the intervention of the Dutch Mennonites the States-General and King William III of England each wrote a letter of intercession to the elector, requesting not only that the Mennonites be granted complete freedom to carry on trade and crafts, but also that their confiscated property be restored. The States-General also wrote to Emperor Leopold, requesting his intervention with the elector to have the persecution of the Mennonites ended. Reluctantly Johann Wilhelm yielded to the pressure of the States-General, the emperor, and the king of England. On 12 April and 17 August 1697, he decreed that the Mennonites should be permitted to carry on free trade and that their property and books be restored to them at once (Rembert, Wiedertäufer). On the whole the Mennonites were given reasonable consideration under John William. The request of a Mennonite named Schnebely to settle in Mannheim was refused, although the mayor had approved it (10 May 1706). On the other hand, the petition of all the Mennonites in the Palatinate to be released from all military service was granted (27 January 1712). Two years later the fee they were paying the state was increased by a considerable sum. Their request to have it reduced, supported by the Dutch Mennonites (15 January 1715), was rejected. Upon his death on 8 June 1716, Johann Wilhelm was succeeded by his brother Karl III Philip. Brons, A. Ursprung, Entwickelung, und Schicksale der Taufgesinnten oder Mennoniten. Norden, 1884. Hege, Christian and Christian Neff. Mennonitisches Lexikon, 4 vols. Frankfurt & Weierhof: Hege; Karlsruhe: Schneider, 1913-1967: v. II, 431. Hoop Scheffer, Jacob Gijsbert de. Inventaris der Archiefstukken berustende bij de Vereenigde Doopsgezinde Gemeente to Amsterdam, 2 vols. Amsterdam: Uitgegeven en ten geschenke aangeboden door den Kerkeraad dier Gemeente, 1883-1884: v. I, Nos. 1427 f., 1749-1753, 1755. Rembert, Karl. Die "Wiedertäufer" im Herzogtum Jülich. Berlin: R. Gaertners Verlagsbuchhandlung, 1899: 530-533. Neff, Christian. "Johann II Wilhelm, Elector Palatine of the Rhine (1658-1716)." Global Anabaptist Mennonite Encyclopedia Online. 1957. Web. 21 Apr 2019. http://gameo.org/index.php?title=Johann_II_Wilhelm,_Elector_Palatine_of_the_Rhine_(1658-1716)&oldid=146521. Neff, Christian. (1957). 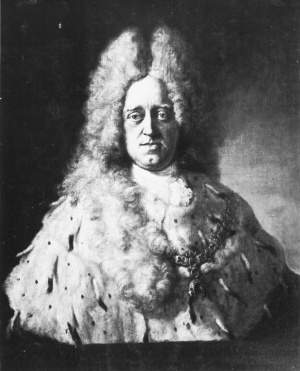 Johann II Wilhelm, Elector Palatine of the Rhine (1658-1716). Global Anabaptist Mennonite Encyclopedia Online. Retrieved 21 April 2019, from http://gameo.org/index.php?title=Johann_II_Wilhelm,_Elector_Palatine_of_the_Rhine_(1658-1716)&oldid=146521. Adapted by permission of Herald Press, Harrisonburg, Virginia, from Mennonite Encyclopedia, Vol. 3, p. 115. All rights reserved.